Visions of doom. A growing evil. A new hero emerges as old alliances unravel. 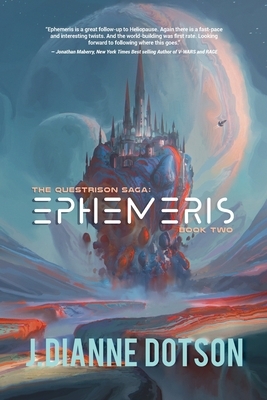 An epic science fiction and fantasy tale with a rich array of characters and settings, Ephemeris: The Questrison Saga: Book Two is the sequel to Heliopause: The Questrison Saga: Book One. Plucked from space and raised in a star-city of androids, impetuous Galla-Deia looks human but is not. Chosen to stop the dual threats of a galactic natural disaster and a malevolent alien entity, she must grow as a commander and gain the trust of both humans and non-humans alike. Unknown to her, the entity draws zealots to its cause, destabilizing interstellar order, and threatening all life in the galaxy.